Concept: We see an interesting relationship between the current trend of grand public architecture and city identity, and the desire to veil a building in its surrounding landscape. How does a contemporary audience of viewers see themselves reflected in this architecture and in the museum’s collection? Is the museum collection in fact veiled by this grand architecture? What is the relationship between the viewer, this building, and the museum’s collection and artistic agenda? Initial Proposal: We will mimic the architectural design of the perforated copper skin of the museum. 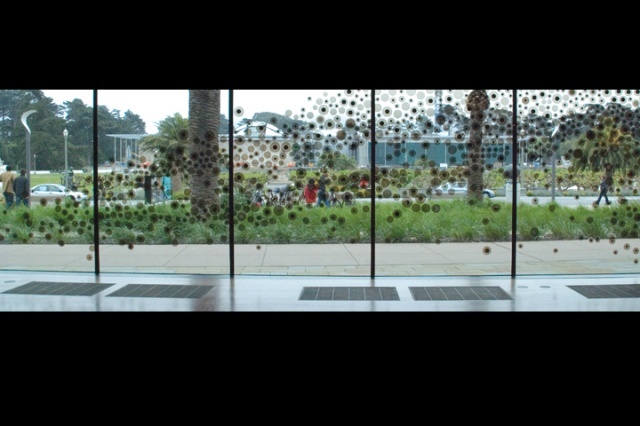 By adhering brown vinyl circles and mirrors to the exterior surface of the windows of the Kimball Gallery, we reflect the viewer’s gaze as well as the park behind them. 4.19.2007 -Submitted proposal ACCEPTED by museum staff. 4.20-26.2007 -Cut 700 vinyl circles and accumulate 450 circular mirrors. 4.26.2007 -Begin installation on window exterior. Museum staff REJECTS project. 4.26-7.2007 -Compromise with museum staff. Revise our concept to connect the exterior with the interior, symbolically perforating the building’s skin. Install circles on the interior windows.